He's pretty happy about too!!! THAT IS THE CUTEST BOY EVER!!!!!! 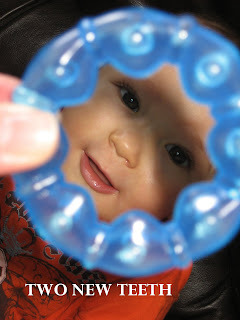 That picture of him in the tooth ring is so dang cute!!!!! Dont you wonder somtimes about Dr.'s do they really know??????? Seriously cute! How on earth did you capture that first pic? You are quite the photographer! Hey Jenny -- SUPER CUTE Andy! I like the last picture -- what is it that his shirt is supposed to say? LOLOLOLOLOL.... ohhhhh, Andy's shirt really isn't profane.... that's a good call Leah! Leave it to you to catch that too.... :) thanks for the chuckle.